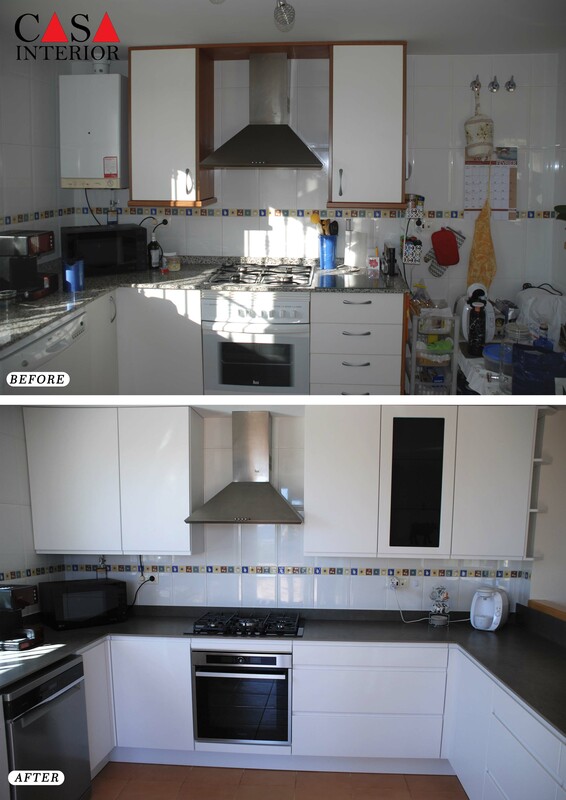 We are very pleased of this kitchen renovation thanks to our fantastic customers who were very close to us designing and choosing all details of this kitchen. Since the first time they wanted an integrated handle with white doors. 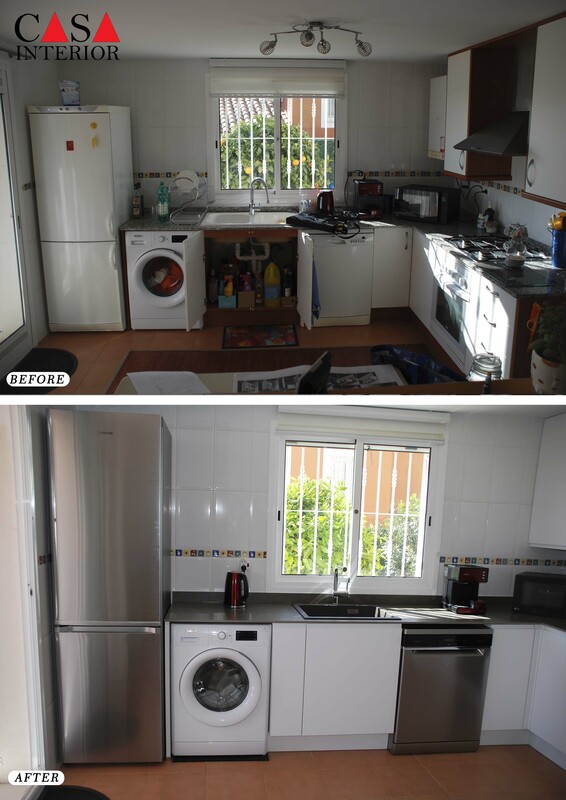 Our best choice was Küchentime Inline Alpine White, a lacquered door of good quality and finishing. 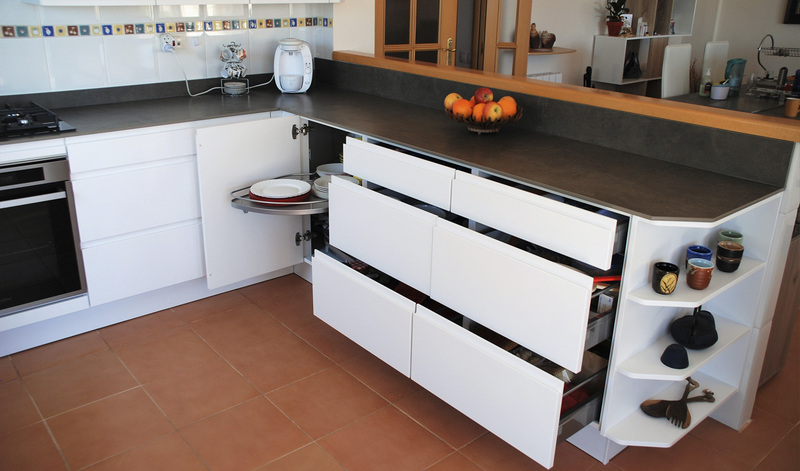 We are very happy and proud of this model of Küchentime, giving the best results you can ask for. 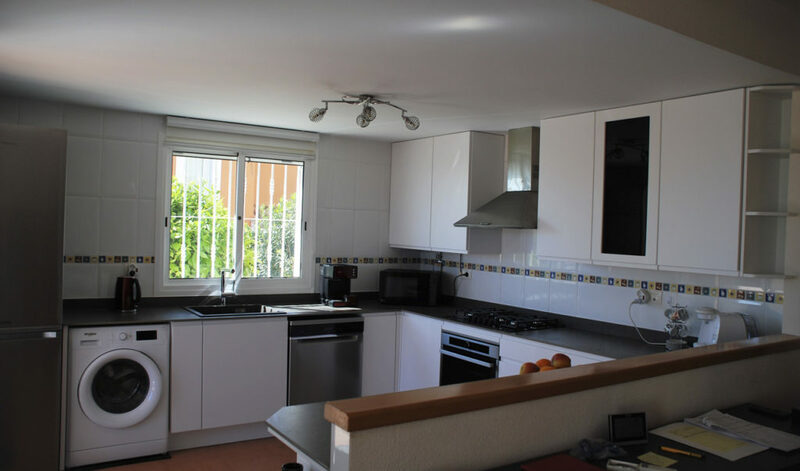 The kitchen has a U shape connected to the living room through a wall at half height. 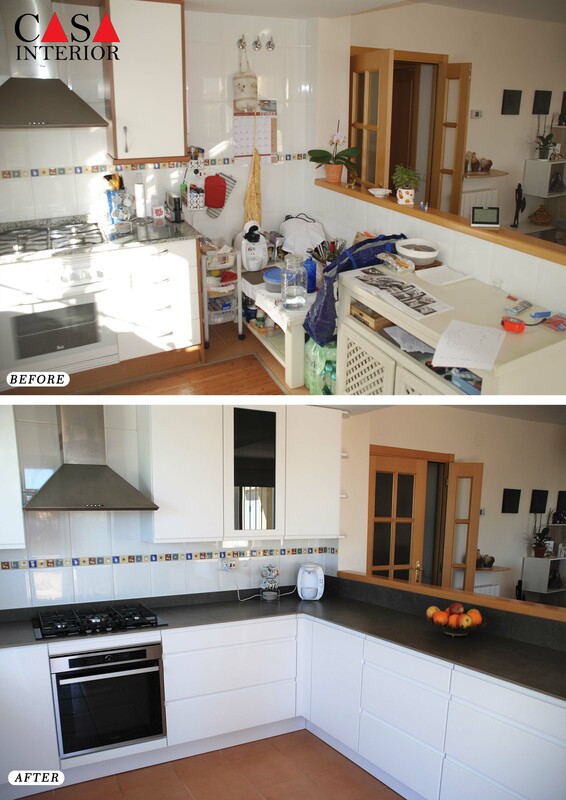 The original kitchen had a L shape, so our clients wanted to complete the rest with more furniture and more worktop. 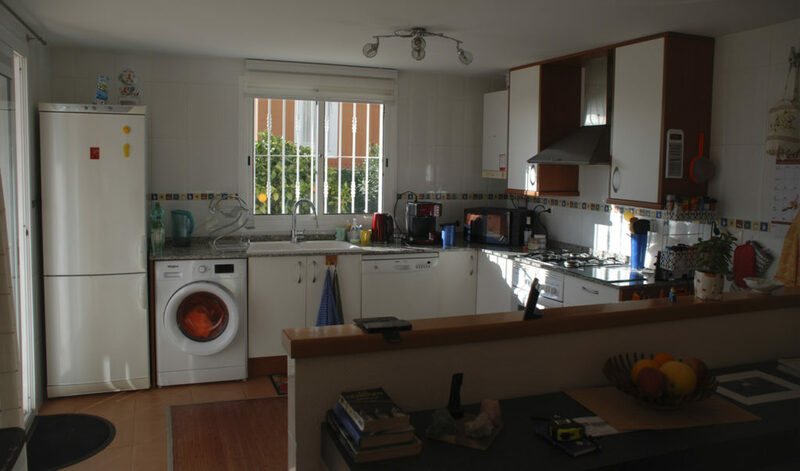 They choose to have free standing kitchen appliances and the election is a free-standing fridge, a washing machine, a dishwasher and a pyrolytic oven from Whirlpool, a gas hob and extractor from Teka. Because the kitchen has one wall with a big window, other with half height and other with a water boiler and an extractor we didn’t have to much space to install wall units. But we could use a 60 cm wide wall unit to cover the water boiler placed in the left corner of the wall, next to it a 45 cm wide wall unit with shelves inside, close to last one is the extractor and after this there are 3 units of 45 cm wide wall units (one with dark black glass door) with shelves inside. At the end of the wall we adapted an open shelf to the wall, so the shelves look coming out from the wall. All wall units are 904 mm high. 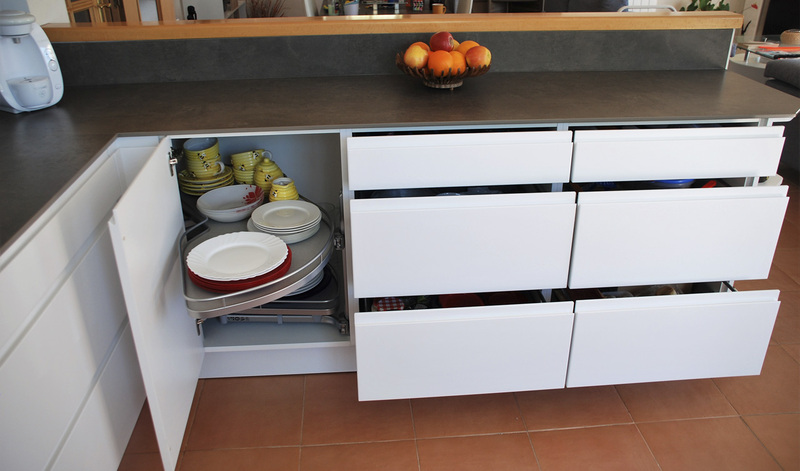 The composition of the base units is; a 25 mm terminal panel with stainless steel bottom; a 20 cm wide pull out base unit with two trays inside; a sink base unit of 60 cm with an aluminium bottom, a 30 cm pull out base unit with two trays inside; a corner unit with shelves inside, a base unit for the oven, a 90 cm wide base unit with 3 drawers; another base unit but with two pull out trays; two base units of 60 cm wide with 3 drawers each one; and a open base unit of 18 cm wide. 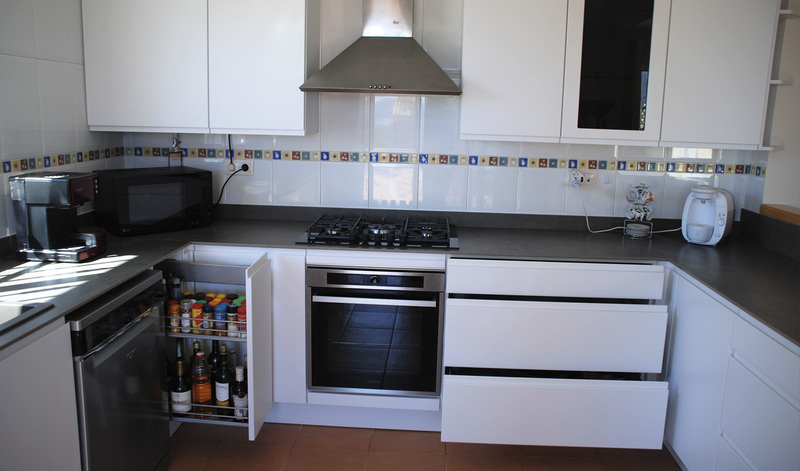 The worktop is Laminam Fokos Piombo in 12 mm thickness and was installed by Marmoles Naturalia. 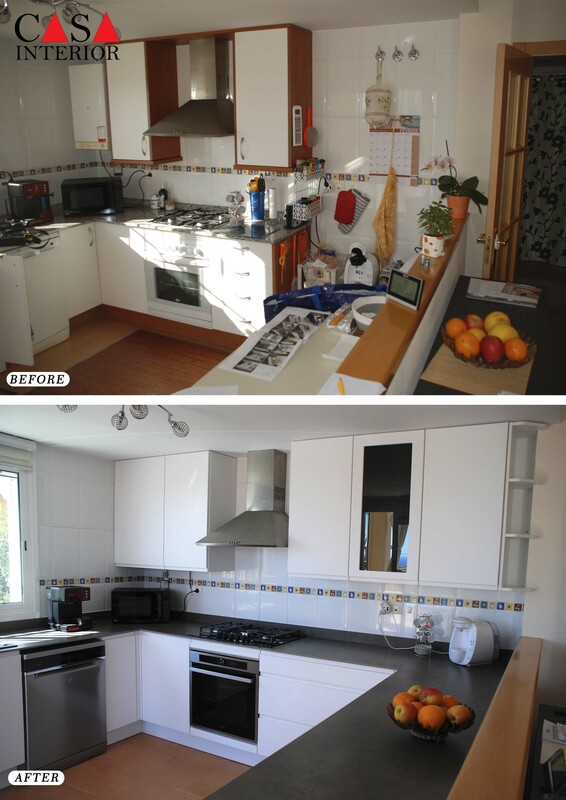 The worktop covers the half height wall and the result is great. The sink is a Pleon 6 in coffee colour and tap is a Mila pull out, both from Blanco.